Kofi Annan, seventh general secretary of United Nations and a Nobel peace prize winner, died on Saturday due to age-related ailments at the age of 80. 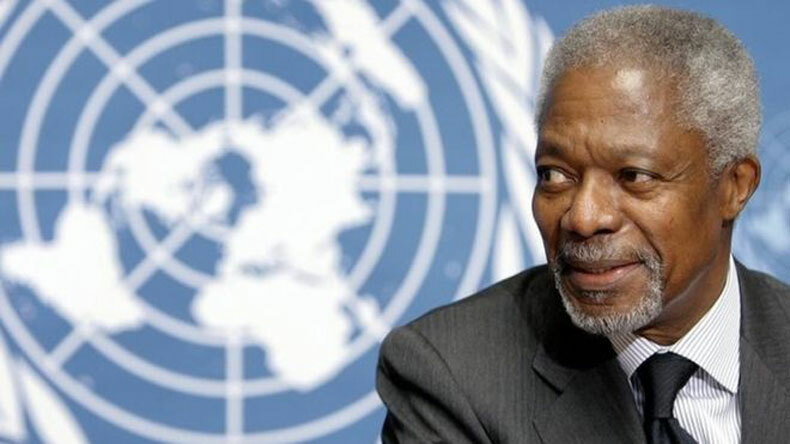 Former United Nations general secretary Kofi Annan passed away on Saturday at the age of 80 after a short illness. The Ghana-born diplomat died in a hospital in Switzerland’s Bern with his wife – Nane – and three children – Ama, Kojo and Nina – by his side. His death was confirmed by his family on Kofi Annan’s official Twitter handle. He was living with his family in Geneva from a long time. Annan’s home country, Ghana, declared it a week of national mourning after the announcement of his demise. Kofi Annan’s foundation took to its official Twitter handle and announced the death of the 80-year-old. The statement called him a “global statesman and deeply committed internationalist who fought throughout his life for a fairer and more peaceful world”. The statement further requested that the family of Kofi Annan has requested privacy at this time of mourning and the arrangement to celebrate his remarkable life will be announced later. He was an iconic figure as he won a Nobel peace prize for his humanitarian work. He served as the seventh general secretary of the United Nations from 1997 to 2006.